Last week I was seized by some deranged enthusiasm for weeding, and I spent a couple of days yanking out piles and piles of one particular plant that was covering all the beautiful bluebells that have come up in the back garden. 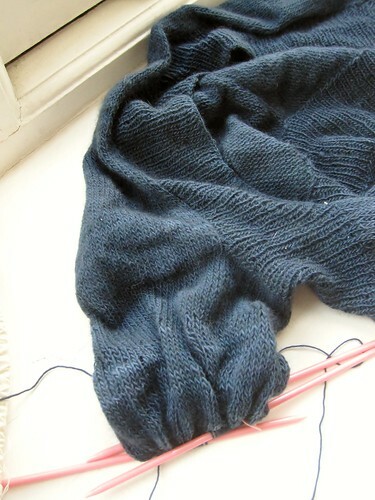 As I collapsed on the couch one evening after the girls went to bed, nursing my sore back and blistered palms, I was inspired to dig up another neglected item: my Whisper cardigan, knit in Malabrigo Lace in Paris Night. 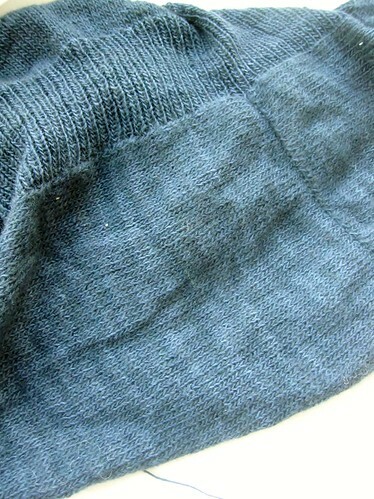 Now, I'm not sure that this colorway has much to do with Paris at nighttime, but it's a lovely navy blue with some subtle variegation. I had stalled out on the body, but my spurt of good intentions meant that I managed to get it to the called-for length before a vicious yarn barf episode resulted in broken laceweight. 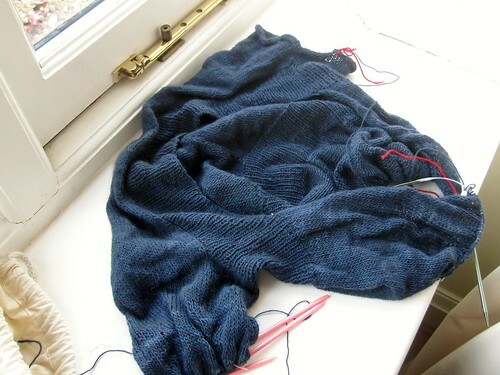 That made it a good time to start working on the sleeves (you probably don't recall, but I have modified the ever-living Bejeesus out of this pattern). As of today, I'm more then halfway through sleeve 1, and have every intention of finishing sleeve 2 by the end of the week. And if things go according to plan**, I should be able to finish the body in the next week. Which should be perfect timing, as we are heading off to the Norfolk coast for half-term, and we all know that going to the beach for a holiday means I'll need a sweater. ** Hahahahahahahahahahahahahah! I'll just sit here and wait for the lightening strike to come. Written by porpoise On May 13, 2013 In "sweaters"